Ships from Hong Kong. 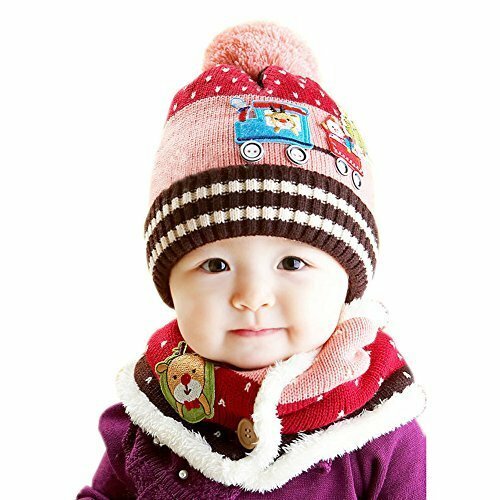 This cute knitting wool hat is made of cotton. Keep your baby warm in winter. Suit for baby about 10-36 months old, head size is about 18.5 - 20.4 inches (47 - 52 cm). Hat's height is about 7.5 inches (19cm). The scarf's width is about 4.7 inches (12cm), the height is approximate 19.7 inches (50cm). There are two buttons in the scarf. It is comfortable and warm. It includes 1 x cap/hat and 1 x scarf. Please select the best fitness size for you baby according to it head size.